When I was in college, I had the opportunity to live in Cuernavaca, Mexico. During my time there, I fell in love with Mexican cuisine, and to this day it has greatly influenced me as a home cook. Seemingly always I try to incorporate the freshness, flavor, and authenticity of these wonderful regional ingredients into any meals that I cook. According to Rick Bayless, "What a lot of people don't know about Chicago is that we have the greatest concentration of artisanal tortilla factories in the world." He said it and its the truth. I have a little Mexican grocer where I find a pack of warm corn tortillas from Atotonilco Tortilleria wrapped in paper, indicating they were made recently and without preservatives- just lime, corn & water. I decided to incorporate this authentic Mexican staple into my appetizer by making a tostada. Grab 2-3 tortillas from the stack. Using a 2-inch cookie cutter or a small glass and a pairing knife, trace and cut out a small circle. In a frying pan, heat oil until a drop of water sizzles immediately when added to it. Once hot enough, add tortillas in a single layer and fry lightly on each side, about 1-2 minutes, or until golden crisp. Remove and drain on a paper towel. Set aside. Repeat. Heat coconut oil over medium-low heat in a large skillet. Add onion, garlic, and habanero chile and sauté for about 5 minutes or until onion is translucent. Add the coconut milk and raise the heat to medium high and bring to a simmer. Cook, stirring occasionally for about 5 minutes, so the flavors can blend together. 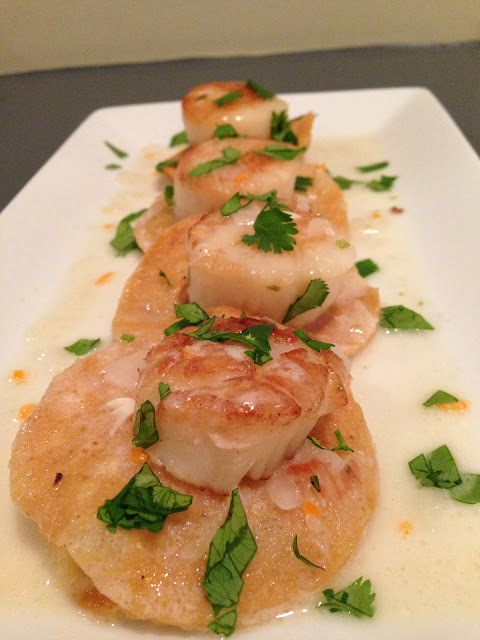 While the coconut milk mixture is simmering, we will turn our attention to the scallops. Heat approximately 1-2 tablespoons of olive oil in a frying pan. Once hot, place the scallops in the oil and sear, turning once, golden on both sides, about 1-2 minutes per side. Transfer the scallops to a plate. Add a little sea salt while they are searing. Next, add the butter, lime juice, and zest to your coconut milk, and add the scallops to this mixture. Cook until scallops are opaque throughout, about 5-7 minutes. Season with a bit more sea salt and fresh ground pepper. lime, and chile sauce on top of tostada and garnish with chopped cilantro. Serve immediately! Thanks for sharing this fabulous dish, Kat! Have shared this and hope you win!!! I can't believe I haven't joined your site yet, I thought that I have already done so in the past....corrected that mistake. Now a new follower. - Abby (Manila Spoon). Fantastic flavor combination -- I so need to give this one a try! I have never been able to cook a great scallop...I think it's the pan I use or something like that but this dish looks so good I might have to invest in a better pan so I can try to make this deliciousness!! It looks so yummy! !